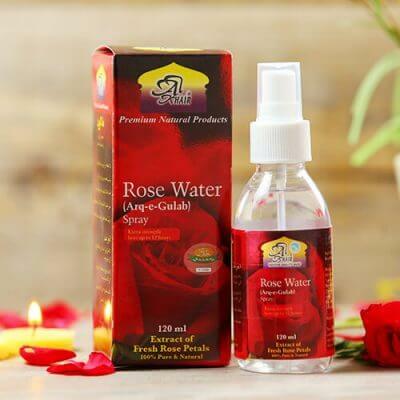 Rose water has been revered by many cultures throughout the centuries for its pleasing aroma in foods and drinks, as a natural skin toner and as a lovely fragrance for both men and women. AL Khair Rose water is distilled from fine rose petals, and is without any additive or preservative. A pleasing fragrance and a natural skin toner, gently sinking in and giving your skin a refreshing feel by removing impurities and dust particles. AL Khair’s extra strength Rose Water lasts up to 12 hours on fabric and can be used orally (as laxative) and externally. The antioxidants in rose water protect the cells in the skin against damage. Rose water also has anti-inflammatory properties, which means it can be put on the skin to soothe the irritation caused by conditions, such as eczema and rosacea. Rose water acts as an inhibitor against elastase and collagenase, which are both harmful to the skin. This, in turn, can help soothe the skin and reduce redness, as well as act as an anti-aging product by reducing the appearance of lines and wrinkles. Due to its soothing and anti-inflammatory effect, rose water can be taken to treat a sore throat. Furthermore, a study has shown that it can act as a relaxant on the muscles in the throat. In its liquid form rose water can be used as part of an eye drop and has been shown to have excellent benefits for people with eye problems. Due to its antiseptic properties and the fact rose water can prompt the creation of histamines by the immune system, it has been shown to be useful for preventing and treating infections. Rose water vapor therapy can be improve mood and aid relaxation. The inhalation of rose water vapors has been traditionally used as a way to improve a person’s mood. The liquid can also be taken orally. Research has shown that rose water has antidepressant and anti-anxiety properties. It is believed to induce sleep and to have a hypnotic effect similar to that of the pharmaceutical drug diazepam. The ingestion of rose water has also been shown to have beneficial effects on the digestive system. It works by increasing bile flow, which helps symptoms of common complaints, including bloating and upset stomach. The consumption of rose water can also work as a laxative. It can increase both the amount of water in the feces and the frequency of going to the toilet, making it a good treatment for constipation. For over 20 years, AL Khair has been dedicated to helping people improve their physical and spiritual well-being by providing pure, premium products aligned with a healthy life style. For over 20 years, AL Khair has been dedicated to helping people improve their physical and spiritual well-being by providing pure, premium products aligned with a healthy life style. We at AL Khair are dedicated to providing beneficial products aligned with a healthy meaningful life style. Copyright © 2019 Exhibit®. All rights reserved.